Tarot with Ashley: Treasure Hunting on Hornby Island - Jackpot! 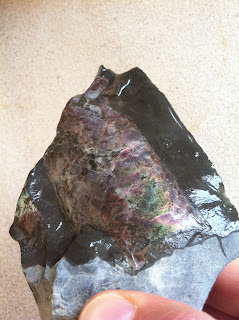 Last weekend I ventured out to the annual Rock and Gem show in the Comox Valley. I arrived empty handed and I left with a lovely fire agate necklace and pair of earrings, courtesy of having won one of the door prize draws. Moreover, I made plans with a few members of the Rock and Gem club to beachcomb the following day on a quaint island two ferry rides away. A full moon two days prior translated to ultra low tides; the beach was ripe for treasure hunting. We were in search of fossils, concretions, and baculites. The second two words I only recently became aware of after spending the day with Russ - Rock Man extraordinaire! Using the tools I photographed below, a hammer-like thing and a chisel, and some force and skill, one literally cracks the concretion open in hopes of finding a hidden fossil or gem. Apparently 1 in 20 have some sort of treasure inside, if I recall correctly. I tried my luck at a few concretions, though they were all empty. One of the women that came along cracked open a concretion to find a lovely crystal formation inside. It was rare and exquisite! I forgot to take a photo...oops. 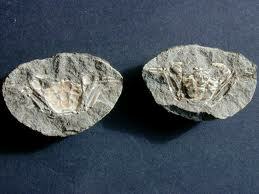 Here is a sample image of a fossil crab concretion that was found on Vancouver Island so you can get the idea. My tired hands, coupled by my amazement at being able to walk so far out on the beach, altered my focus by the afternoon. I became enthralled by the abundance of aquatic life.